"With all its flaws and its harmful impact on college behavior, why is anyone still paying attention to these college rankings?" – from a posting by Lynn O'Shaughnessy writing for CBS/MoneyWatch shortly after U.S. News & World Report (U.S. News hereinafter) released their annual college rankings of 1,800 colleges @ midnight on September 10. Of course readers of RTE know there is something "better out there" & it has been the subject of many posts over the years – it is the ACTA WhatWillTheyLearn project that involved years of research that resulted in college students who used the ACTA resource saving thousands of tuition dollars while getting a better education than they ordinarily would have. If you know someone who is considering going to college, & this is important to you, I suggest studying this post closely – I will compare vis-a-vis the U.S. News college rankings to those of the ACTA project. 1. Princeton – graded "C" - courses not required for graduation - literature, U.S. history, economics, & math. 2. Harvard – graded "D" – courses not required for graduation - literature, foreign language, U.S. history, economics, & math. 3. Yale – graded "D" - courses not required for graduation - composition, literature, U.S. history, economics, & math. 4. Columbia – graded "B" - courses not required for graduation - U.S. history, economics, & math. 5. Stanford – graded "C" - courses not required for graduation - literature, foreign language, U.S. history, & economics. The U.S. News criterion 1) does not reward schools that graduate students who find solid employment (in fact, U.S. News doesn't even ask about employment success), 2) fixates on how selective a school is by focusing on the academic caliber of a school's freshmen with no follow up to what happens in subsequent years, 3) concentrates on the subjective area of what people think about the school's reputation including academic peer assessment judging faculty dedication to teaching, & 4) awards brownie points for money spent on beautiful campuses, modern student unions, & athletic shrines to sports heroes. The U.S. News criterion is soft especially when you compare it to ACTA's grading system that is based solely on what students are required to take & pass in order to graduate. ACTA's grading of schools is focused on seven key areas of knowledge (composition, literature, foreign language, U.S. history, economics, math, & science) so that students & parents will know what graduates will be well versed in outside their majors. For a school to be graded "A" by ACTA, in addition to courses in their major, students are required to take & pass @ least six of the above subjects in order to graduate. Just look @ the above list of top five schools & the subjects that are not required in order to graduate. Only people in the "good ole boys" network would pay over $40,000 per year in tuition for a degree where the graduate never took a college algebra course or was awarded an English degree & yet never read a play by the Bard while in college. Now the (dis)favor is returned in that U.S. News does not rank the ACTA "A" schools particularly high either. For instance Pepperdine, University of Georgia, & Baylor are three of ACTA's "A" graded schools & U.S. News ranks these schools #57, #60, & # 75 respectively in their survey of 1,800 schools. Other ACTA graded "A" schools were the University of Dallas – ranked #13 amoung 121 regional west universities by U.S. News; Thomas Aquinas College – ranked #135 in regional colleges north; & the U.S. Military Academy ranked #17 in the limited category of national liberal arts. Many other ACTA "A" schools were unranked by U.S. News. Although some ACTA "A" schools have high tuitions there are many like CUNY Brooklyn College & California Polytechnic State University – San Luis Obispo where the tuition is less than a third to half the price of the U.S. News top schools. At Cal Poly undergraduate students can choose from almost 70 majors, with engineering programs being the most popular choice. There are more than 80 state-of-the-art laboratories and 50 clubs dedicated specifically to the Cal Poly College of Engineering so a graduate will have an engineering degree & in order to have graduated will also have passed courses in composition, literature, U.S. history, economics, & naturally both math & science. Parents & students don't have to just focus on the eighteen schools (out of the 1,000 evaluated) that ACTA has graded "A" – there are many fine schools graded "B" but the point is by using the ACTA website resource you can work to find the ones that meet your needs & when you do you will know what your money is going to buy regarding subject material & ultimately what will be learned. I do believe that everyone has to make their own way & living in the world without being a burden on others (regardless of educational level obtained) & that this should cumulatively lead to a higher standard of living for mankind – graduating from college with a professional degree is one great way to accomplish these twin goals. The problem is that people are graduating from many colleges today who don't know anything useful thanks to grade inflation & the diluted course curriculums discussed above. There are three times more "A"s given today than in 1940. There are tests now being given by employers for graduates to prove what they know about their major – these tests are required because employers do not trust just the sheepskin any longer – an insult to academia in & of itself. Caterpillar & Microsoft are two employers who cannot find enough Americans with the skills they need @ any education level. Please look @ the above table of test scores & note the corner of the world where the top five countries in both math & science are located. These types of results not only indicate that Americans are not well prepared or suited to compete in the global economy @ a high level but they also provide a good insight into the country's economic deterioration. This point has repeatedly been presented on RTE & is the first of two barrels that my analysis of the two academic surveys fire. The second barrel is more insidious & sinister in undermining America because it does not affect your economic well being as directly or as initially noticeable as the firing of the first barrel does – the second barrel is the consistent thread that U.S. history is not required by so many colleges - like all of the top five U.S. News schools listed above. But the problem goes deeper - college graduates aged 21 to 34 did very poorly on the ACTA history test I posted on August 26 meaning not only is U.S. history not being taught in college it is not being taught @ the most rudimentary level in K through 12 either. You can conclude that tradesmen & others with no more than a high school education will not know the basics of U.S. history any better than college graduates do – this is an extremely dangerous position for a country wanting to survive to be in. A country whose people are unfamiliar with its heritage is not going to be around long – @ least not in its current form. Ever wonder how this happened? Thanks to a long time subscriber for sending an alert regarding a piece of legislation entitled The Americans With No Abilities Act. Trouble is the government doesn't need new legislation in this regard since it has been promoting the principles of the act for years. But this one is all in fun. The original piece was published by the satirical newspaper The Onion (self billed as "America's Finest News Source") in 1998. Variants like the version below have been widely circulated including one Australian version. All of the fabricated quotes in the original were attributed to Bill Clinton but have been updated to more current political figures except for (the fictitious) Mary Lou Gertz who remained in all the versions although her job changed from an unessential filing clerk in the original to a lug-nut twister in the version making the rounds today. The Onion's articles comment on current events, both real and fictional. Decide for yourself if the piece below is fictitious or does it describe exactly what is going on in America today? In a Capitol Hill press conference, former House Speaker Nancy Pelosi and Senate Majority Leader Harry Reid pointed to the success of the National Railroad Passenger Corporation better known as Amtrak, which has a long-standing policy of providing opportunity without regard to performance. Approximately 74 percent of Amtrak employees lack any job skills, making this for-profit enterprise that loses $1 billion annually even with government subsidies one of the largest U.S. employers of Persons With No Ability. The Transportation Security Agency was a close runner up to Amtrak as a favorite in a poll among politicians. Under the act, it will be perfectly acceptable to be in second place. This posting is to alert readers to a new piece on the left hand side of RTE entitled A Critique Of The Final Report Of The President's Advisory Panel On Tax Reform Specifically As It Pertains To The FairTax. It is the last topic listed under The FairTax. Following the executive order of GW Bush the subject panel studied several tax plans & issued a final report on November 1, 2005. Although the panel's report is several years old it continues to be used by critics of the FairTax to take advantage that it is one of the most misunderstood documents ever written especially as it (does not) pertains to the FairTax. The biggest single problem centers around one of the report's nine chapters addressing a national retail sales tax. 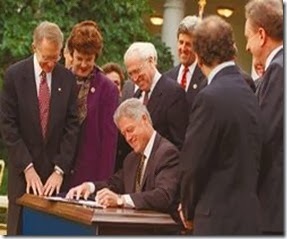 Although it is not always called by name (the FairTax was called by name in only three places in the panel's report) it has been taken by critics of the FairTax that chapter nine of the panel's report was describing the FairTax which simply is not so for the reasons detailed in the above critique. The problem is that critics of the FairTax – like people with vested interests in the current income tax system – have disingenuously presented unfavorable & opposing points every chance they can from the panel's report as if the panel was addressing the FairTax. The above critique addresses such opposing points to set the record straight. People who thought Mitt Romney would win the presidency in 2012 did not realize America was turning into a single issue nation – & that issue is we all have to eat every day & with no prospects for quality jobs people followed the path of least resistance. In this case BO provided that path through government benefits instead of work & many people found they enjoyed the additional leisure time as they came to realize there are numerous ways to spend their time other than working. What's not to like? Accordingly, the election was not about the Arab world, the budget deficit or national debt, China's military build up, Iran's uranium enrichment, Venezuela, the price of gasoline, or even Dubya. Put another way - Americans chose free stuff over freedom & BO was seen as the provider of free stuff. In this new election-normal no one cared about BO's dismal economic record in his first term. Leisure was too much fun. Along the way in implementing his planned ruinous fundamental transformation of America, BO can run into issues that divert attention from his purposeful destructive agenda – like the IRS abuses of power, the Benghazi murders & cover up, & now the Syria red line matter. BO is not interested in a positive outcome for the nation regarding these troubles – he just wants to get these unwanted distractions off the front page & behind him so that he can get to the rest of his real agenda which is to make the citizenry totally dependent on government. When forced to address these types of annoying (to him) issues BO can from time to time make decisions that appear he is on the same pro-American team as the rest of us. This is the beef I have with reporters like Bill O'Reilly, Brit Hume, & Larry Kudlow – that they don't report what the evidence clearly shows the way Jon Voight did in Jon Voight's Open Letter To America. BO is not on our team regardless of what the coincidentally favorable results of any specific issue might by chance show. Add them all up & the preponderance of the evidence is devastating for America. All that really matters to BO is dispatching the above types of issues as quickly as possible so that he gets back to implementing the rest of ObamaCare, passing comprehensive immigration reform legislation, beefing up the unions, expanding the work of environmentalists through the EPA implementing unlegislated crippling Cap & Trade rules, & starting the process of nationalizing private pension money by seizing or otherwise confiscating IRAs & 401(k)s like Pelosi recommended in 2008 following BO's first election. BO has a specific agenda to accomplish these goals & that agenda has nothing to do with family values, human rights, civil rights or whether or not Syria used chemical weapons on their own people. After looking like a war hawk on Syria since August 31 BO has now endorsed a "diplomatic pause" to see if the "Russian solution" that was brought about by the threat of what Secretary of State John Kerry called an "unbelievably small force" can in the words of Bret Stephens "get Assad to relinquish a chemical arsenal he used to deny having, now denies using, & will soon deny secretly maintaining." This approach has all the potential to get Syria off the front pages in a few days & then fade from memory the way the murders in Benghazi almost one year ago to the very minute has. But of course none of this matters any more to the American people @ all – we have collectively deteriorated to the point in our dependence on government that all we are concerned about is leisure time & our next meal – it is this principle & BO's rotten opponent in 2012 that got BO reelected despite the worse economy in decades. We have succumbed – American exceptionalism has been replaced by human nature. Steve Moore points out that in the twenty five years after the enactment of Reagonomics America's net worth increased $40,000 billion & nearly 40 million Americans were added to the business workforce. In January 2009, when BO took office, there were 80.5 million Americans not in the labor force. Congressman Frelinghuysen analyzed August's unemployment data & pointed out that in August for the first time in our history there were 90.5 million people over 16 who are not in the labor force – a one month increase of over half a million people & an increase of 10 million people since BO took office who have to eat every day. The above statistics clearly show the fundamental transformation of America that BO has in mind. As a follow up to the last post concerning America's needed financial responsibility discussed @ Senator Tom Coburn's Town Hall meeting last month below are two recent O'Reilly Factor memos that address additional economic points. Bill makes some excellent points but misses one very big one – namely, the majority of the electorate has twice elected the country's biggest enemy since King George III & all of the economic hardship & misery is the result of BO's deliberate plan. It is a world of our own making. The first memo below describes the economic problems we are facing today & includes many facts that have been presented on RTE. The problem is that Bill never quite connects all the dots & after portraying a miserable state of affairs for the country still asks "why President Obama doesn't understand that I simply don't know." How much evidence do people need to realize the financial hole we are digging for ourselves only gets deeper every day & not only does BO understand this he is the one who is providing & operating the heavy duty excavating equipment that is digging the hole. Bill discussed this with a guest & commented "If the President were a baseball manager he would have been fired; the economy has not improved in five years!" But BO wasn't fired; he was reelected meaning something else is in play & that something is people have substituted government benefits for jobs & BO is only too willing to accommodate. Below is an analysis of every group of workers that shows the effects of BO's plan of economic destruction & government dependence, now in its fifth year of implementation. BO has reversed the upward income mobility most people experience during their working years. Economist Steve Moore reports that in the four years since the economic recovery started in June 2009 the incomes of households headed by single women is down 7%, people under 25 down 9.6%, blacks down 10.9%, Hispanics down 4.5%, & workers with high school education or less down 8%. Ironically these are the voting blocks that carried BO to victory in 2012. 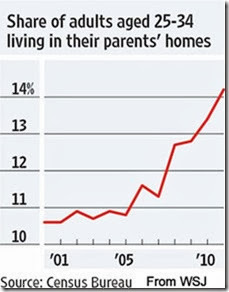 See graph below to see the effect of BO's policies on household incomes of all groups. There certainly is a contribution to the downward mobility curve made by people in the highest income earning group (usually people reach this group starting in their middle to late 30s & accordingly are distinguished from high net worth individuals). People in their 50s or over who have been out of work for any appreciable period of time will never work again except possibly in some meager part time job. 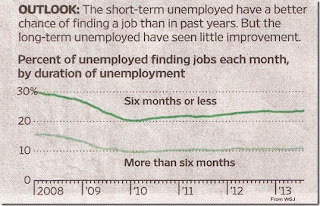 The graph below indicates that only 10% of the 4.25 million people unemployed six months or longer find work each month. The percentage of those over 50 finding work each month is even less. I know of a case where a person in their late 40s lost a good paying job with benefits several years ago & now receives disability. They recently moved in with a parent who receives Social Security. Since this is still not enough to maintain the house & living expenses another family member chips in. This type of example is quite prevalent across the country as many people over the past several years have moved in with other family members with every able bodied person getting whatever mediocre job they can find & of course topping this off with government benefits & their own wealth spend down. What a way to make ends meet. This family consolidation trend includes college graduates returning home with no job or job prospects. If parents are not careful their wealth spend down hurts their own retirement plans. The WSJ reports 22.6 million adults (36% of the total) between 18 & 34 living with their parents, 26% of the parents have taken on debt because of the kids living with them, 7% of parents have delayed their retirement because of the kids moving back in, & 30% of parents gave up privacy due to their adult children. 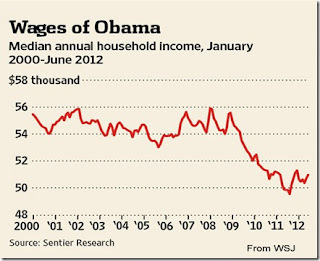 See graph below – BO did not start this trend but his policies capitalize on it. The graph represents 9 million young people who have forfeited one quarter of their lifetime earning ability – something they will never make up. Recent college graduates have mountains of student loan debt & have moved back with their parents to record high levels as indicated in the above graph. Fifty three percent of college graduates under 25 are either unemployed or underemployed. Bill writes in his second memo below "you do that (start @ a fast food restaurant) to get experience & a better job...& if you get educated & work hard you will not be making minimum wage." BO's policies are designed to make sure the very young get no work experience – the graph below shows that even though teen unemployment rates have declined somewhat they are still way too high to give many young people a chance @ gaining needed experience. Over five years ago BO clearly told us that he planned to fundamentally transform America & the above information documents that he is well on his way – all the worst for the unsuspecting public the longer it goes on. As shown above every group is worse off under BO's policies & that is by design. The sooner Bill & others start to call this out the better off everyone will be. All of this deterioration of America is exactly what BO is working for. BO didn't create all of this but he sure came along @ the right time to accelerate it & prolong it. BO's two election victories are a reflection of the majority of the electorate. Now you can say that the majority did that but not you. The question then is exactly what did you do to contribute to preserving the republic that is under an onslaught of attack every day? Only you can answer that in your heart of hearts & make amends as you see fit. "In order for more than 300-million Americans to have a chance at prosperity you need a vibrant economy. The USA does not have one and that is now on President Obama. The President's focus is on 'economic justice,' giving help to Americans who don't have much. 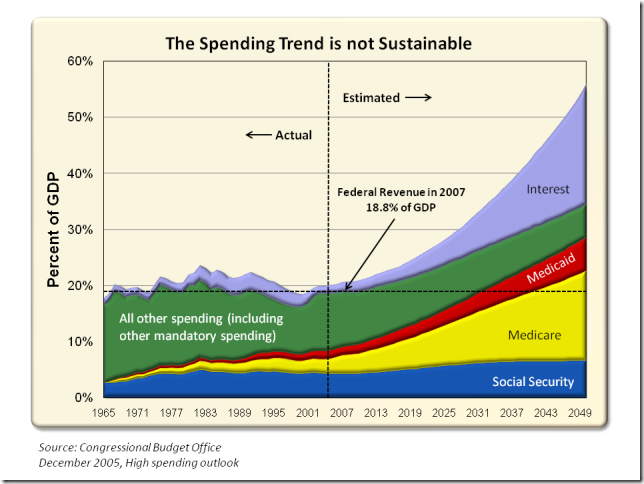 Providing vast federal entitlements means big spending and taxation. Also, the President doesn't seem to trust the capitalistic system and has instituted regulations that might be inhibiting business expansion. 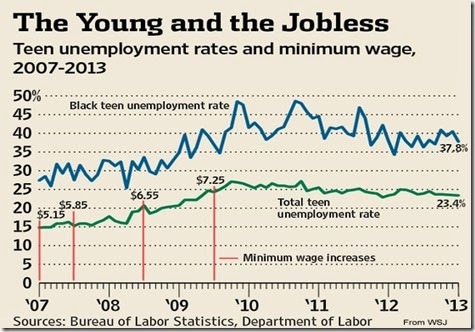 So the 'social justice' plan is failing and the U.S. economy is stagnant, as are wages for working Americans. 7 out of 8 jobs created during the Obama administration have been part-time jobs and 54% of American workers make less than $30,000 a year. 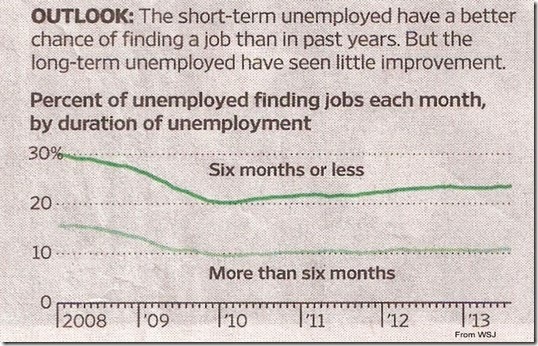 When Mr. Obama took office the average duration of unemployment paid to an individual was 20 weeks, now it's 37 weeks. More than 8-million people have stopped looking for work and Americans receiving food stamps increased by 11,000 every single day during the President's first term. Democrats blame income inequality and want even more federal intrusion into the economy; Republicans want the exact opposite, believing that helping private business expand is the key to a more competitive marketplace. Talking Points understands that wages rise when workers are in demand, but today competition for jobs is driving wages down. Only business expansion will turn that dire situation around, and why President Obama doesn't understand that I simply don't know." "Thousands of Americans working in fast food places are demanding that their wages be doubled to $15 an hour. President Obama is sympathetic and the left generally believes our economic system is unjust to working Americans. So let's take a look at that, beginning with my working history. My first job was at a Carvel stand where I was paid minimum wage. I understood that I was a rookie and could get a recommendation, so I didn't complain about the pay. The next summer I got my lifeguard certification and became a water safety instructor, making five times more than at Carvel. The next year I needed more money so I started a painting business and did that for five summers. Then I went to graduate school and drove a taxi in the summer. After graduating with a masters in broadcast journalism, I took a very low-paying job at a TV station in Scranton, Pennsylvania. I had to work for peanuts, but I knew that if I did good work I would rise up. Nobody's forced to work at a fast-food joint, you do that to get experience and a better job. The USA is a capitalist country and if you get educated and work hard you will not be making minimum wage. But many Americans feel they are entitled to high-paying jobs, and if they don't secure them, here come the charges of 'economic injustice' and 'oppression.' If the workplace where I was became unjust or unproductive, I went someplace else. So let's stop the whining, shall we? This country offers huge opportunities. Seize them!" Senator Tom Coburn's excellent Town Hall - Muskogee, Oklahoma - August 21, 2013. This was the 5th Town Hall the senator held that day. Senator Coburn has been mentioned on RTE many times in the past (six times in 2013 alone) & this Town Hall is a good example why. One of the questioners @ the meeting said he wished there were 100 like him in the Senate & oh, so do I. 1. Our constitutional republic is @ risk because of the very things the Founders warned us about. 2. We have undermined self reliance in the name of being charitable. 3. We have abdicated personal responsibility in the name of being fair. 4. In answer to the charge that Congress needs to work together better Senator Coburn says we (the Congress) are working together way too well – that is why the country's financial problems are not being solved. America's unfunded liabilities have a NPV of $123,000 billion & assets of $84,000 billion. The Tea Party tsunami in the House in 2010 still resulted in 85% of incumbents in both parties being reelected – down from 94% in 2008. See nearby graph to see just how well Congress works together. 5. The unfunded liabilities & interest costs will be paid by today's children in the form of a markedly decreased standard of living such as the inability to buy a house or inability to send their kids to college. There is no leadership in either party willing to solve our problems. 6. There was more than one spirited discussion re how to defund ObamaCare (something I have to see to believe). 7. America has followed in the footsteps of what every historian has noticed about constitutional republics – they don't last. Readers of RTE know this as Death Of Democracy. All of the above points should be quite familiar to regular readers of RTE. But this time they come to you from a different perspective – from people who took the time to come to a meeting to see with their own eyes & hear with their own ears from one of their elected representatives.